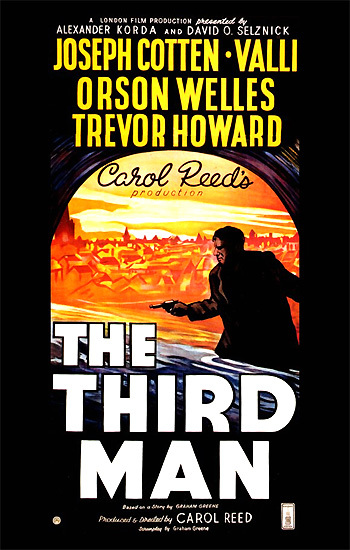 The Third Man (1949) is a visually-stylish thriller - a paranoid story of social, economic, and moral corruption in a depressed, rotting and crumbling, 20th century Vienna following World War II. The striking film-noirish, shadowy thriller was filmed expressionistically within the decadent, shattered and poisoned city that has been sector-divided along geo-political lines. The black and white, pessimistic film is one of the greatest British thrillers of the post-war era, in the best Alfred Hitchcock tradition, and beautifully produced and directed by Britisher Carol Reed. It was voted the #1 British Film of the 20th Century by the esteemed British Film Institute (BFI). It was co-produced by Hungarian-born Alexander Korda and American movie mogul David O. Selznick. Because Korda gave American distribution rights to Selznick (who cut eleven minutes from the original British version), the credits of the US version include Selznick references. This was Reed's second collaboration with British screenwriter-author Graham Greene (after The Fallen Idol (1948)). It was based on Greene's novella of the same name, written solely to be a source text for the film screenplay and never intended to be read or published. It was a clever and original mystery tale simply evoked by one sentence written by Greene: "I saw a man walking down the Strand, whose funeral I had only recently attended." It told of a love triangle with nightmarish suspense, treachery, betrayal, guilt and disillusionment. Its two most famous sequences include the Ferris-wheel showdown high atop a deserted fairground with the famous cuckoo clock speech (written by Orson Welles), and the climactic chase through the underground network of sewers beneath the cobblestone streets. The director knew that the film's musical score could not be reflective of the traditional Old Vienna - waltz music by Strauss. Instead, it would be provided by a solo instrument -- a zither. The jaunty but haunting musical score by Viennese composer/performer Anton Karas lingers long after the film's viewing with its twangy, mermerizing, lamenting, disconcerting (and sometimes irritating) hurdy-gurdy tones. In fact, Karas' musical instrument was a leading film character and advertised as such: "He'll have you in a dither with his zither (a laptop string instrument)." The insistent, chilling music sets a mood of polarized dislocations in the world (e.g., war and play, men and children) and in the corrupted city's 'no-man's-land' environment (with its bombed out, war-torn ruins, dark and slick streets, cemeteries and sewers criss-crossing beneath the sectored zones). Surprisingly, it was nominated for only three Academy Awards in 1950, including Best Director, and Best Film Editing. Its sole Oscar was for Robert Krasker's vivid, atmospheric, moody black/white cinematography (although the final long cemetery walk scene was actually shot by uncredited German cameraman Hans Schneeberger). Unusually reckless, canted camera angles (one of their earliest uses), and wide-angle lens distortions amidst the atmospheric on-location views of a shadowy Vienna cast a somber mood over the fable of post-war moral ambiguity and ambivalent redemption. The deliberately unsettling, tilted angles reflected the state of the ruined, fractured and dark city, filled with black marketeers, spies, refugees, thieves, and foreign powers seeking control. he made a magnificent ending." Lime, Harry Lime....I thought he'd be here to meet me. An accident, knocked over by a car in front of the house, have seen it myself, killed at once, immediately. Already in hell [pointing up mistakenly] or in heaven [pointing down mistakenly]. Sorry for the grave diggers. Hard work. It is frost. [The film both begins and ends with a funeral sequence and the burial of the same person.] Holly hurriedly rushes to the gravesite in the cemetery to attend Harry's funeral. As he approaches, he inquires about the cryptic ceremony, and is told by a distant onlooker (later identified as Major Calloway): "A fellow called Lime." A priest is saying prayers in German at the gravesite as Martins arrives - there are only a few stoic-faced onlookers and one beautiful woman. [Later, we learn it is Harry's Czech grieving mistress/girlfriend Anna Schmidt, a Russian exile and refugee.] After the ceremony, Martins is given a ride to town by cynical British military police officer Major Calloway (Trevor Howard). As they ride down the main road, Calloway notices the attractive dark-haired woman who was at the graveside walking towards the city. He follows her receding figure while looking out the car's back window. Holly (with an American accent): 'Death at Double X Ranch,' uh, 'Raunch' (feigning an English accent)? [Him dying like that] It was the best thing that ever happened to him...He was about the worst racketeer that ever made a dirty living in this city...You could say that murder was part of his racket. Believing in Harry's innocence as a petty crook, Holly is enraged by the accusation that his friend is a racketeer who illegally sold not "gasoline (petrol)...tires or saccharin" but something else. [The artistic influences of his Western pulp novels, making him 'the lone rider' of his own stories, convince Holly, mistakenly, that Harry was a victim of Calloway - a 'sheriff' authority figure.] Holly tries to grab and slug Calloway (whom he mistakenly calls Callahan), but the agent is protected from harm by Calloway's aide Sergeant Paine (Bernard Lee). Paine, who knows of Martins' literary work, punches the drunken writer in the face and Calloway orders the "scribbler with too much drink in him" to be taken home to a British military hotel - and adds a harsh proposal that he leave on the next day's plane. It's a story about a man who hunted down a sheriff who was victimizing his best friend...I'm gunning just the same way for your Major Callaghan (sic). We came out of this place like this and were walking this way. A friend [a Rumanian friend of Lime's named Popescu] of his called to him from over there. Harry went across and from up there came the truck. It was just about here... (He looks down at the ground.) His friend and I picked him up, and carried him across over here. (A car honks) It was a terrible thing, terrible. We laid him down, just about here. And this is where he died. Even at the end, his thoughts were of you. Martins: (Gesturing toward the porter) But he said he died instantaneously. Martins: So it was only you and this friend of his, uh, who was he? Martins: I'd like to talk to him. Kurtz: He-he has left Vienna. Martins: Wasn't that girl there (at the cemetery)? Martins: Oh not necessarily. She'd probably want to help. Kurtz: What's the good of another post mortem? Suppose you dig up something - well, discreditable to Harry?... (cryptically) But I still think it won't do Harry any good. You'd do better to think of yourself. Martins: (chuckling) I'll be all right. At his military hotel when he returns, Holly is presented with a plane ticket sent by the persistent Calloway for the next day's plane. He hands the ticket back to the sergeant: "You tell the Major I won't need it. Oh porter, order me a ticket tonight for the Josefstadt Theatre." Anna: That [Kurtz] was the man who brought me some money when Harry died. He said Harry had been anxious at the last moment. Holly (recognizing the same concern Lime felt for him): He said he remembered me too. It seems to show he wasn't in much pain. Holly (astonished): He was Harry's driver? Up to this point, Holly had never really considered murder as the cause of the accident, but now suspects that all the evidence points in that direction.